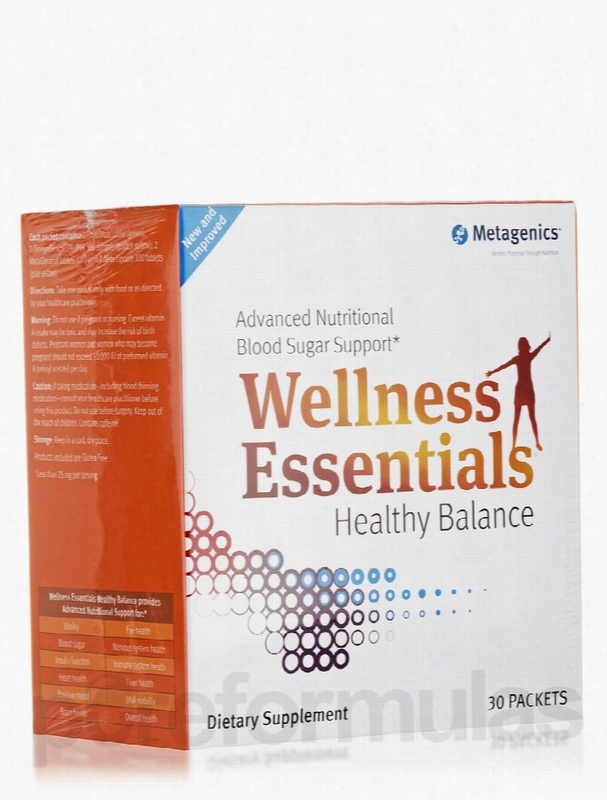 Metagenics General Health - Wellness Essentials Healthy Balance - Box. Advanced Nutritional Blood Sugar SupportPersonalized Nutrition with Targeted Blood Sugar SupportTo maintain a healthy balance of energy throughout the day&sbquo; your Body may need extra nutritional support for healthy blood sugar and insulin levels. Wellness Essentials Healthy Balance is formulated to target your unique nutritional needs to help you maintain healthy blood sugar levels already in the normal range when taken as part of a healthy diet.Each once-daily packet provides:Multifaceted health support: PhytoMulti&trade; is the &ldquo;smart multi&rdquo; with essential nutrients and a proprietary blend of 13 concentrated extracts and phytonutrients to help protect cells and maintain DNA stability&mdash;activating health potential like no other supplement.Insulin activity and blood sugar level support: MetaGlycemX&trade; is a scientifi cally advanced formula to be used as nutritional support along with a healthy diet to help maintain healthy insulin and blood sugar levels already in the normal range.Healthy insulin function: Meta Lipoate&reg; is a USP-grade preparation of alpha-lipoic acid (ALA) that delivers maximum value and effectiveness with an excellent safety profile.Heart health&sbquo; mood&sbquo; and overall health support: EPA-DHA Extra Strength&reg; Lemon-Flavored is a quality-guaranteed omega-3 fatty acid formula manufacturedProducts included are Gluten Free.Total amount includes catachins and EGCG contributed by decaffeinated green tea extract from MetaGlycemX and PhytoMulti.Less than 25 mg per serving.1 PhytoMulti tablet (green)&sbquo; 2 EPA-DHA Extra Strength Lemon-Flavored softgels (golden yellow)&sbquo; 2 MetaGlycemX tablets (tan)&sbquo; and 2 Meta Lipoate tablets (pale yellow). These statements have not been evaluated by the Food and Drug Administration (FDA). These products are not meant to diagnoseÃ¢ÂÂ treat or cure any disease or medical condition. Please consult your doctor before starting any exercise or nutritional supplement program or before using these or any product during pregnancy or if you have a serious medical condition. 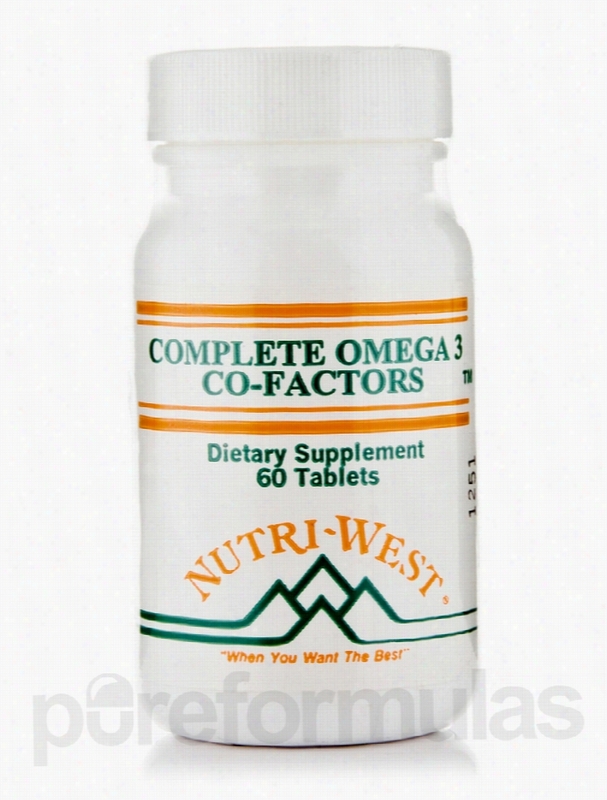 Nutri West Cardiovascular Support - Complete Omega-3 Co-Factors (Adult. Taking omega-3 fatty acids is important. They are essential fatty acids that our body can't synthesize naturally&sbquo; meaning we must ingest them through our diets or a nutritional supplement. However&sbquo; it's possible that nutritional intake is only half the battle. The rate of utilization and absorption also plays a large role. In essence&sbquo; you can be taking the right dosage of omega-3s&sbquo; but if you're body isn't absorbing them to their fullest capacity&sbquo; it's possible that the nutrients would be wasted. That's why Nutri West has formulated Complete Omega-3 Co-Factors&sbquo; a nutritional supplement formulated to help your body absorb and utilize omega-3 fatty acids in addition to other potential health benefits. Some of these ingredients include: CoQ10 This substance may feature numerous potential health benefits like supporting Cardiovascular health. Some studies and individual experience suggest that CoQ10 (also called Coenzyme Q10) may be able to support energy production; this belief stems from the fact that CoQ10 plays a role in the production of ATP&sbquo; which is a factor in generating cellular energy. CoQ10 may also play a role in other chemical transformations within the body. Glutathione Produced primarily in the liver&sbquo; glutathione&sbquo; like CoQ10 plays a role in numerous bodily functions. For example&sbquo; the development and maintenance of tissue may require glutathione. It also could possibly play a role in chemical transformations in the body. Alpha-Lipoic Acid This chemical is often cited as having antioxidant properties&sbquo; which means that it may seek out and neutralize free radicals (atoms in our body that have unpaired electrons)&sbquo; which may pose possible heath risks. Nutri West provides nutritional supplements to health care professionals in order to optimize their patients&rsquo; well-being. It was founded in 1981 and has expanded into a worldwide company with state-of-the-art&sbquo; environmentally-friendly manufacturing and packaging processes. Its products are hypo-allergenic and have been formulated for the highest quality. These statements have not been evaluated by the Food and Drug Administration (FDA). These products are not meant to diagnoseÃ¢ÂÂ treat or cure any disease or medical condition. Please consult your doctor before starting any exercise or nutritional supplement program or before using these or any product during pregnancy or if you have a serious medical condition. Biogenesis Nutraceuticals Snacks - UltraLean Gluco-Support Bars Peanut. Bioclinic Naturals Detoxification - 7-Day ReduceXS - 1 Kit. 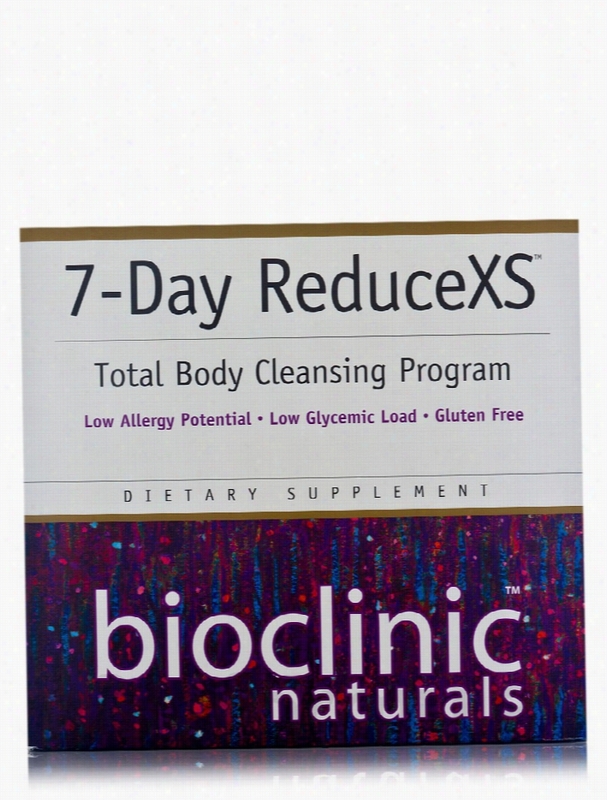 If you&rsquo;re looking for a convenient cleansing regimen&sbquo; you might want to try Bioclinic Naturals&rsquo; 7-Day ReduceXS&trade; Kit. The 7-Day ReduceXS&trade; Kit is comprised of three components: RestorX&trade; Intestinal Repair Nutritional Drink Mix&sbquo; DetoxiCleanse&trade; Detoxification Nutritional Drink Mix&sbquo; and a packet of colon and liver support pills. Both drink mixes are gluten-free and have a low glycemic load. First&sbquo; take one scoop of RestorX&trade; Intestinal Repair Nutritional Drink Mix twice daily for four days. This meal replacement contains N-acetyl Glucosamine&sbquo; L-glutamine&sbquo; and probiotics that may help address certain symptoms associated with leaky gut syndrome (including bloating) by working to reduce the permeability of your intestines. 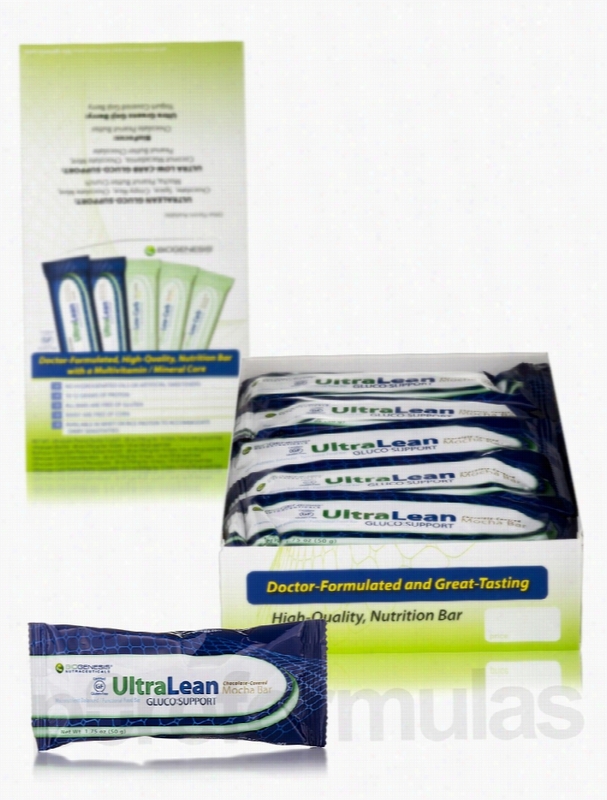 Subsequently&sbquo; use DetoxiCleanse&trade; Detoxification Nutritional Drink Mix as a meal replacement twice daily for three days. Two scoops provide milk thistle extract as well as other nutrients and herbs that may have a mild detoxifying effect. During all seven days of the 7-Day ReduceXS&trade; Kit regimen&sbquo; take the liver and colon support tablets and capsules for additional support in eliminating toxins from your body. Each 7-Day ReduceXS&trade; Kit by Bioclinic Naturals provides all of the supplies you need for a gentle week-long cleanse. These statements have not been evaluated by the Food and Drug Administration (FDA). These products are not meant to diagnoseÃ¢ÂÂ treat or cure any disease or medical condition. Please consult your doctor before starting any exercise or nutritional supplement program or before using these or any product during pregnancy or if you have a serious medical condition. 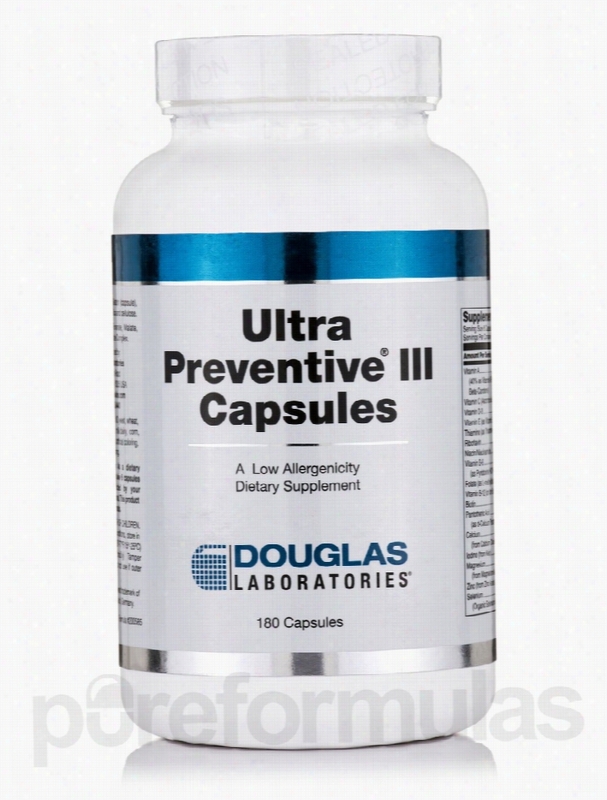 Douglas Laboratories Cardiovascular Support - Ultra Preventive III -. You know&sbquo; in a perfect world&sbquo; our diets would be ideal and our bodies would be appropriately nourished as a result. But let's be real&sbquo; we all know that isn't the case. In fact&sbquo; given the over-availability and low price of greasy foods that feature almost no beneficial nutritional value&sbquo; it wouldn't be a stretch to assume that a good majority of individuals out there had any number of nutritional gaps in their diet. That's why a multivitamin like Ultra Preventive III from Douglas Labs can be extremely beneficial. If we don't get the essential Vitamins we need from our diets&sbquo; then we may experience any number of nutritional deficiencies&sbquo; which is nothing to take lightly. 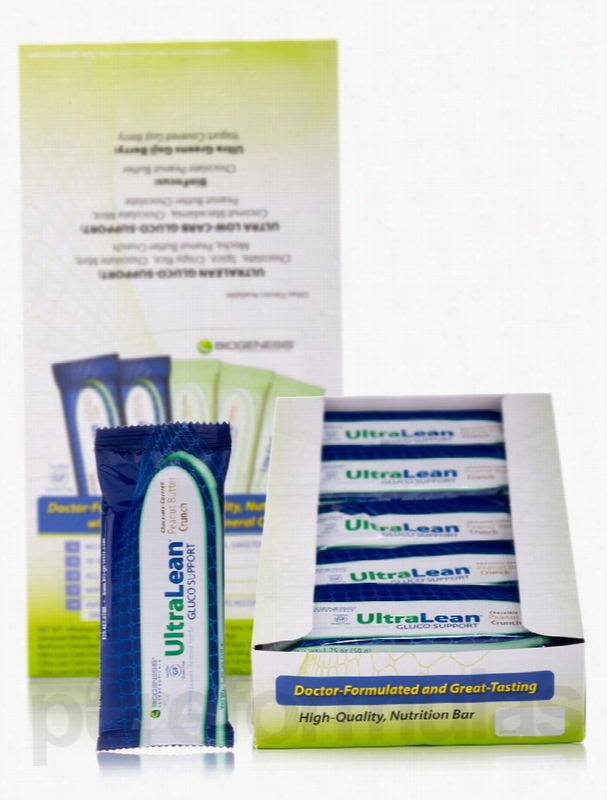 Ultra Preventive III features several essential vitamins like vitamin D&sbquo; vitamin C&sbquo; several types of B vitamins&sbquo; and more. In addition&sbquo; Ultra Preventive III also features several essential minerals like Calcium&sbquo; Magnesium&sbquo; Potassium&sbquo; and much more. The inclusion of these essential minerals and essential vitamins means that Ultra Preventive III supports a wide range of health-related functions like bone health&sbquo; cardiovascular health&sbquo; immunity&sbquo; blood cell health&sbquo; plus more. Ultra Preventive III goes above and beyond other multivitamins by also including ingredients with antioxidant properties. Now&sbquo; many people have heard of antioxidants&sbquo; but it's possible that they aren't aware of exactly what antioxidants may do. An antioxidant can be any substance that has the ability to find and eliminate free radicals in our body. A free radical is an atom that has an unpaired electron&sbquo; which&sbquo; in essence&sbquo; means that it may cause some cellular damage&sbquo; which could put us at risk for certain health problems. But by including antioxidants in its formula&sbquo; Douglas Lab's Ultra Preventive III may help mitigate these potential risks. Douglas Laboratories is a pioneer in the field of personalized nutrition. Since its founding in 1955&sbquo; Douglas Labs has been on the leading edge of nutritional technology&sbquo; allowing it to provide superior vitamins and other supplements. All Douglas Labs facilities meet or exceed ISO 9001 &amp; ISO 17025 quality standards. With such attention to safety and use of only the best ingredients&sbquo; you can trust the products that come from Douglas Laboratories. These statements have not been evaluated by the Food and Drug Administration (FDA). These products are not meant to diagnoseÃ¢ÂÂ treat or cure any disease or medical condition. Please consult your doctor before starting any exercise or nutritional supplement program or before using these or any product during pregnancy or if you have a serious medical condition. 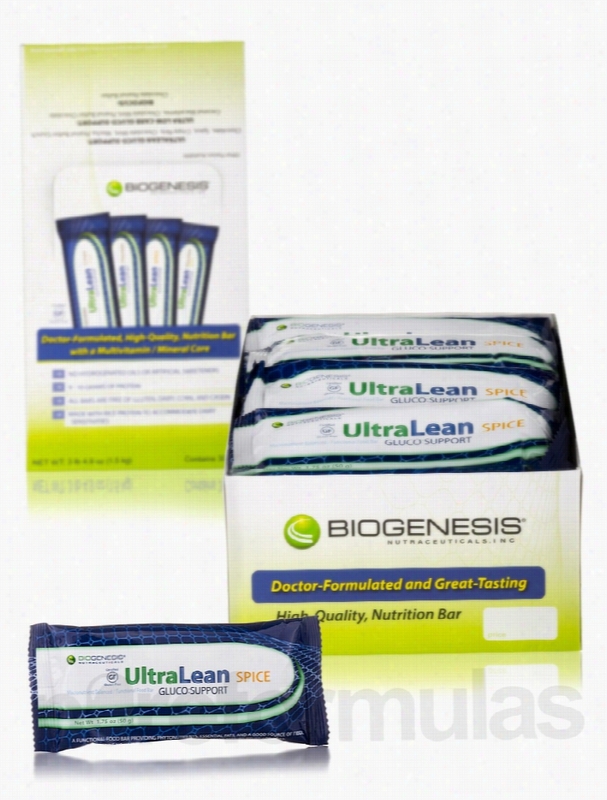 Biogenesis Nutraceuticals Snacks - UltraLean Gluco-Support Bars Mocha. Bioclinic Naturals Gastrointestinal/Digestive - RestorX - 16 oz (450. 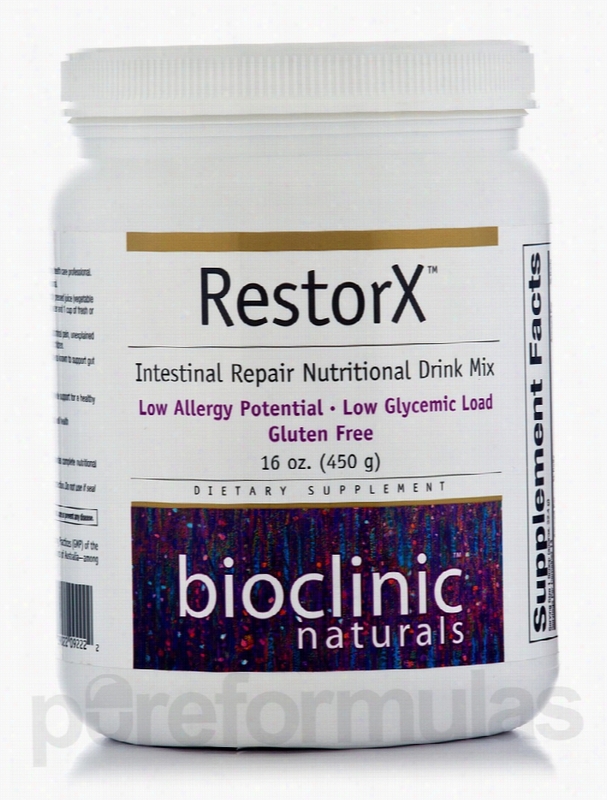 If you&rsquo;re looking for a powdered supplement that may work to support the functioning of your GI tract&sbquo; you might want to try RestorX&trade; Intestinal Repair Nutritional Drink Mix by Bioclinic Naturals. Specifically&sbquo; this powdered supplement could regulate the permeability of your intestinal membranes. While some permeability is essential in order for nutrients to pass through your gut&sbquo; excess permeability can contribute to mild bloating and cramps as well as other symptoms associated with leaky gut syndrome. For this reason&sbquo; RestorX&trade; Intestinal Repair Nutritional Drink Mix contains a blend of nutrients that could play a role in managing intestinal permeability. Significantly&sbquo; quercetin is a flavonoid that may work to stabilize mast cells; by working to maintain the integrity of the tight junctions in your gut&sbquo; mast cells may act to prevent toxins and other harmful substances from leaking into your bloodstream. Furthermore&sbquo; RestorX&trade; Intestinal Repair Nutritional Drink Mix contains organic-sprouted brown rice&sbquo; which means that it could potentially serve as a gluten-free source of protein. Take one scoop once or twice daily. At the recommended serving size&sbquo; each 16-ounce container of Bioclinic Naturals&rsquo; RestorX&trade; Intestinal Repair Nutritional Drink Mix should last for about one or two weeks. These statements have not been evaluated by the Food and Drug Administration (FDA). These Products are not meant to diagnoseÃ¢ÂÂ treat or cure any disease or medical condition. Please consult your doctor before starting any exercise or nutritional supplement program or before using these or any product during pregnancy or if you have a serious medical condition. Biogenesis Nutraceuticals Snacks - UltraLean Gluco-Support Bars Spice. 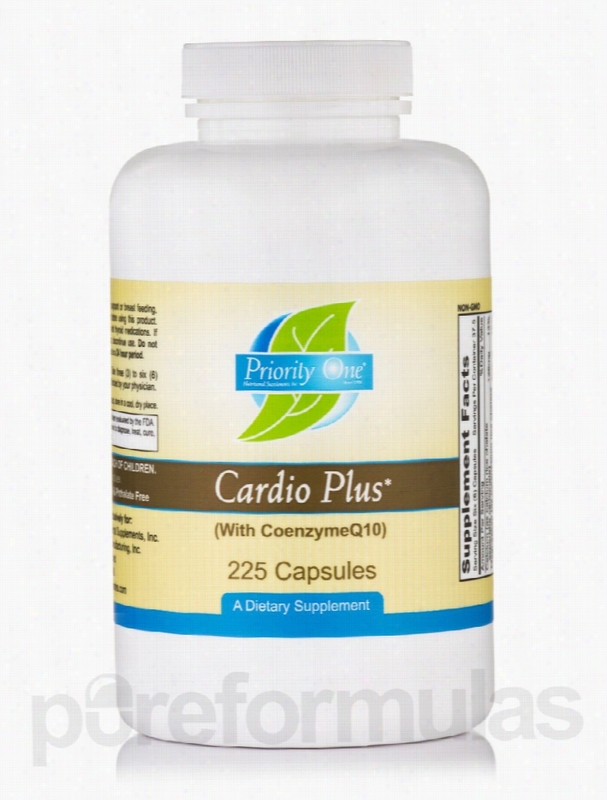 Priority One Cardiovascular Support - Cardio Plus (with CoenzymeQ10) -. Cardiovascular Health is essential to your overall wellbeing. The human body needs nutritional support in order to function properly. Unfortunately&sbquo; doing so is easier said than done. For a more convenient way to get necessary nutrients&sbquo; try a supplement like Cardio Plus with Coenzyme Q10 by Priority One. Each capsule contains important minerals like calcium&sbquo; magnesium&sbquo; selenium&sbquo; chromium&sbquo; and potassium. These nutrients promote energy production while supporting the heart and blood vessels. Cardio Plus with Coenzyme Q10 also has natural ingredients like hawthorne berries&sbquo; selenium&sbquo; and chondroitin sulfate. Chondroitin may work to discourage mild joint pain and stiffness that can sometimes interfere with physical activity. In addition&sbquo; this supplement provides coenzyme Q10 (CoQ10). CoQ10 is essential to the basic functioning of your cells and helps your body convert food into energy. One bottle of Priority One&rsquo;s Cardio Plus with Coenzyme Q10 contains 225 capsules&sbquo; which should last for about 37 days at the recommended dosage of two capsules&sbquo; three times a day. This product may react negatively with thyroid medications. Stop taking this supplement immediately if you experience heart palpitations. As a manufacturer of high-quality natural health and nutritional products&sbquo; Priority One is committed to serving health care professionals and patients. Priority One is a family-owned and operated company that was established a quarter of a century ago. Its focus is on developing potent&sbquo; safe&sbquo; and effective nutritional supplements that enhance the lives of users. These statements have not been evaluated by the Food and Drug Administration (FDA). These products are not meant to diagnoseÃ¢ÂÂ treat or cure any disease or medical condition. Please consult your doctor before starting any exercise or nutritional supplement program or before using these or any product during pregnancy or if you have a serious medical condition. 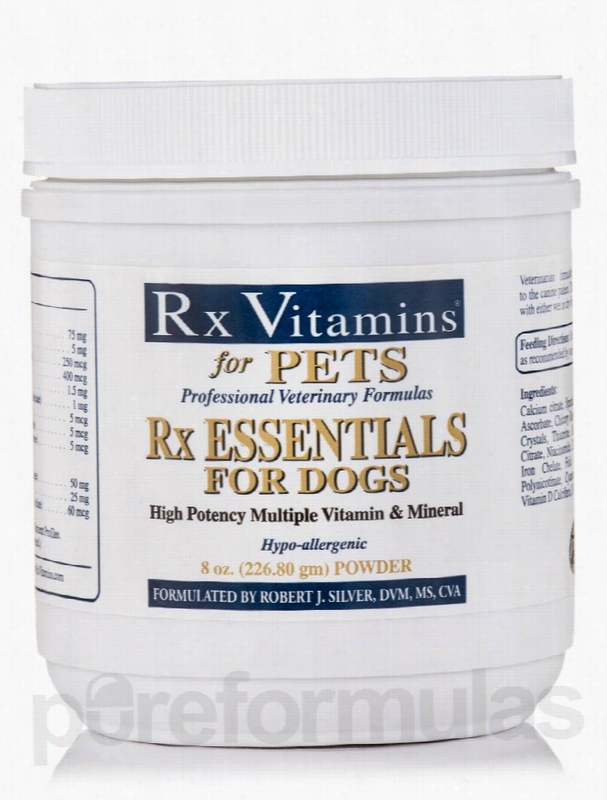 Rx Vitamins Dogs - Rx Essentials for Pets (Dogs) Powder - 8 oz (226.80.